In case you needed another reason to garden, a bunch of evidence has sprouted up in the past few years showing that kids learn better and eat healthier when they have access to their own beds. Gardens stimulate little ones’ interest in ecology—and let them get their hands a little dirty in the process. A home garden will definitely help your future botanist’s interests bloom, and it will also give you a chance to spend some precious time working together. But let’s be honest, not every kid has a natural proclivity toward nature, especially with video games and other seated activities beckoning from the indoors. The projects below are fun and kid-friendly, to draw your little one away from the iPad and out into the great outdoors. You don’t have to go through the looking glass to bring the topsy-turvy fun of Alice’s adventures right to your backyard. A few thoughtfully-placed tea cups and DIY toadstools will get you a magical look that should keep kids spellbound. Teacups can even make a nice border for a whimsical edging bed—you can use them as small containers for succulents surrounding bed interiors. And you can make your own toadstool using a ceramic pot and drain plate. Cover the pot with white ceramic paint and then paint the top in a bright mushroom-top color, like orange, purple, or red. Allow both pieces to try, then turn the pot upside down, and place the plate on top of that. Paint the whole project with a clear sealant. What do you get when you take a regular old bathtub, plop in a handful of easy-to-grow plants and sprinkle it with a little fairy dust? A garden that’s both fun and beautiful, that’s what! Find an old bathtub, washtub, or pot, and dig a hole of appropriate size in your garden. Place the vessel in in the hole and fill it with soil, then add some container-friendly plants like strawberries, violets, or small succulents. Complete the scene with tiny stone paths, doll furniture, and even solar lights, guaranteed to capture the interest of budding imaginations. Not into fairies in your house? This idea could easily be turned into a prehistoric playland for dinosaurs, as well. While the earlier beds focused on the fun, an older child may be more attracted to a garden that’s a little more serious. Cinder blocks make great building bricks for a DIY raised bed—unlike wood, they don’t need to be cut or nailed together, which just adds grueling hours of man labor to the project. 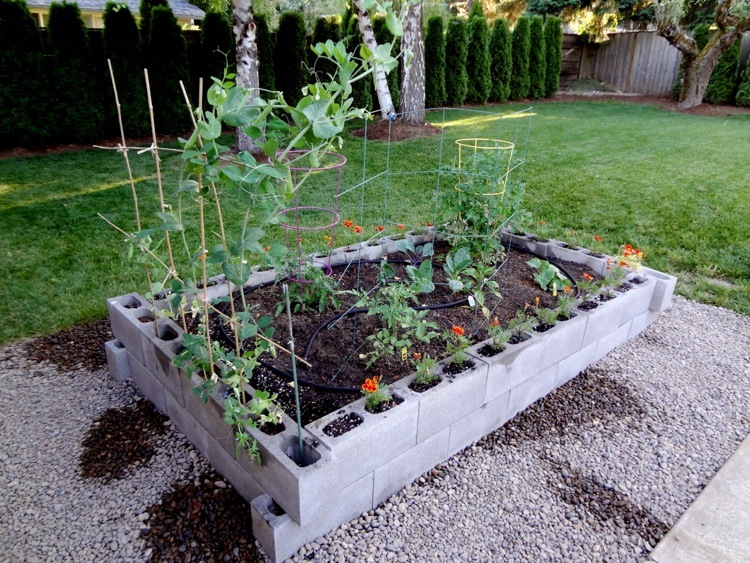 Just lay some landscaping fabric down and stack cinder blocks to your desired garden size. Then cut the excess fabric. Fill the interiors of the cinder blocks and the interior of the bed with garden soil, and stock with your favorite edibles. Packed stone borders are an easy, low-maintenance alternative to pavers and walls, and you can involve the kids and get a timeless keepsake out of the bargain when you hand paint border stones. Kids love the opportunity to have some say-so over the garden’s design, and you can let them get as creative as they want. Putting their own stamp on the garden, and allowing them to help you build, plant, and maintain beds will definitely help them feel like a vital part in the process, which will hopeful encourage a budding interest in gardening for years and years. What Other Ways Have You Used Cinder Blocks?